This is a café situated in an art gallery – or perhaps it is the other way round? 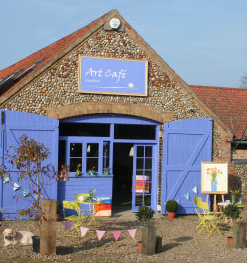 Glandford Art Café is quite a special little place serving excellent vegetarian food. The café is located at Manor Farm Barns, Glandford in the lovely Glaven valley. The entrance to the site is off the Letheringsett to Wiveton road about four miles out of Holt. When you turn in to what was once the farmyard you will see the café’s decorative facade. Next to the café is another art gallery and a boatbuilder’s workshop. At the top of the yard is CleySpy, a retail outlet selling a huge range of binoculars and telescopes for birdwatchers and stargazers – certainly worth a look around. But I digress; I must get back to the café. At the front of the building is the gallery section, where pictures, cards and various other attractive items are on display. Walking through you come into the café area: low beams and scrubbed tables. The service counter is impressive as some of the food is displayed on platters – a mouth-watering enticement to place an order. There are chalkboards at the rear of the counter showing the full menu. I have eaten there several times now and the food is locally sourced, is of excellent quality and also reasonably priced. The staff are friendly and the service is good. If you visit the café at lunchtime during the weekend you may be in for a special treat as live music is sometimes featured. During one excellent lunch we were all entertained by young musicians from the Purcell School. You might also hear a harp being played or a pianist accompanying a singer of English folk songs. When you have finished your meal I suggest that you take a walk down into the village. You will find a pretty un-bridged ford at the bottom of the street with a view along the River Glaven towards Glandford Watermill (now a private residence). Nearby are the unique Glandford Shell Museum and the parish church. The interior of the village church is very ornate and a visit is rewarding. The Art Café is open all year round Monday to Saturday 9.30 a.m. to 6 p.m. Sunday 9.30 a.m. to 5 p.m. The telephone number is 01263 741711. For your Satnav: NR25 7JP. I went there recently and found it to be everything you said. The Lebanese lentil soup was especially delicious. No music when we went unfortunately – perhaps next time we will be lucky.